But CCSS proponents insist the standards have nothing to do with data collection. What's the true story? The information will be individualized (see below) so it's really not so much about the schools as it is about individual data, right? What is their response to this Illinois Data Warehouse September 2010 pdf document? The State Core Model is a common technical reference model for states implementing state longitudinal data systems (SLDS). It was developed by CCSSO as part of the Common Education Data Standards (CEDS) adoption work with funding from the Gates Foundation. The Model includes early childhood (EC), elementary and secondary (K12), post-secondary (PS), and workforce (WF) elements, known collectively as “P20,” and establishes comparability between sectors and between states. 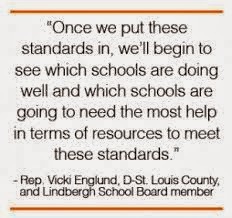 The State Core Model will do for State Longitudinal Data Systems what the Common Core is doing for Curriculum Frameworks and the two assessment consortia. The core purpose of an SLDS is to fulfill federal reporting (EDEN/EDFacts), support SEA, LEA, and research data-driven decision making, and enable exchange of comparable data between education agencies. The Model could enable states to vastly reduce the number and burden of data collection by replacing 625 distinct Federal reporting types with record-level data collections. In addition, it is designed to support dropout early warning intervention systems (DEWIS), positive behavior intervention systems (PBIS) and response to intervention (RTI), balanced scorecard performance management, and provide and extensible model capable of accommodating future needs. 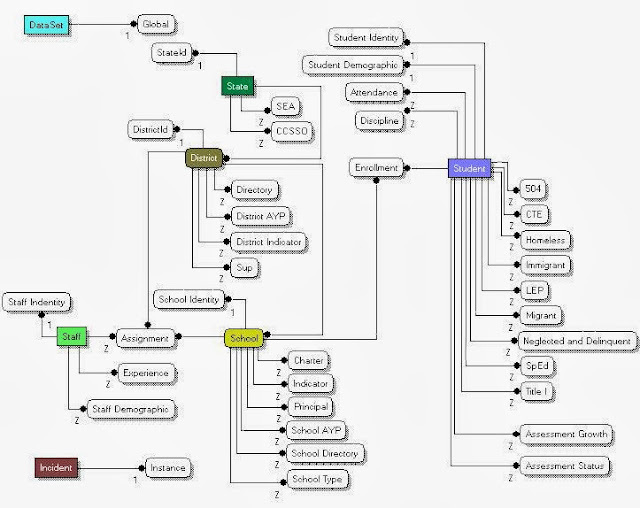 The Model is designed to address unique, complex P20 SLDS relationships, business rules, and entity factoring including: properly distinguishing “official” vs “un-official” (but possibly more current) data; source files with different and or non-existent start and end dates; complex relationships between organizations; and people with multiple roles in multiple organizations including student-teacher linkage. It addresses student-teacher link, common assessment data model, and comes pre-loaded with Common Core learning standards. The State Core Model consists of three principle artifacts: (1) this document; (2) the “State Core Workbook” an Excel 2007 file containing the data dictionary and maps; and (3) a physical data model with scripts to support implementation of the model in major technical platforms. All three artifacts can be downloaded and used without charge or attribution from [the EIMAC group site]. 1 . The State Core Model will be used by the CEDS Adoption Implementation Task Force (AITF) to validate, improve, and expand future versions of the standards. It incorporates and acknowledges work previously published, specifically the National Center for Education Statistics (NCES) data handbook, National Education Data Model (NEDM) v2.0, Early Childhood Data Collaborative (ECDC) recommendations, School Interoperability Framework (SIF) v2.4 specification, Post-Secondary Electronic Standards Council (PESC) schemas, State Higher Education Executive Officers (SHEEO) State of State PS Data Systems report , and Common Education Data Standards v1.0. Like a car naviagation system, the learning management systems of the future will know the current location of each learner and be able to plot multiple, individualized paths to the Common Core and other academic goals. Students will be able to select preferences of modality of instruction, language, and time. And, like a car navigation system, even if they decide to take a detour, the system will always now where they are, where they want to do, and multiple paths to get there. The last two subjects are not central to the model, but are sufficiently important to warrant their own subjects. The first is Standards and Assessments. These entities have relationships to both People and Organizations. While ISBE may currently not have needs to store overly complex assessment information, it is expected that Illinois’s participation as a governing member of the PARCC assessment consortium will require more complex assessment data structures and maps to the Common Core academic standards. It shows the global sharing goal on the powerpoint. Why was this information left out of the December report? Why is the connection between Common Education Data Sets (CEDS) and Common Core left out of the report? Do you believe the Common Core is not an important data collection vehicle? How else are the assessments to be gathered, accessed, shared and compare if there are no common assessments and coded data sets? The sets are coming pre-loaded with Common Core learning standards, so the expectation is that the assessment data will be gathered via these standards and assessments. This link, (http://www.ibhe.state.il.us/academic%20affairs/p20.htm), will enable you to see Illinois' 2013 workforce plan and the MOU the state signed with the Gates Foundation in 2007 to establish common data sets and become the leader in data gathering/sharing of student information. There is a clear expectation that this data gathering will extend to a number of states and will be shared on a national level. MN, MT, NC, NH, NJ, NM, NV, NY, OH, OK, PA, SC, TN, TX, UT, VT, WA, WI, WV, and WY. · 20 states were met with: AR, CO, CT, DE, IA, KS, MD, ME, MT, NC, NJ, NM, NY, OK, PA, TX, UT, VT, WA, WY. In this phase, mapping involved 4-5 hours of research per state with publicly published materials. The meetings were single, 1-hour webex sessions. Deep mapping involved development of comprehensive metadata workbooks. This phase also involved mapping to 79 EDFacts file specifications. An initial draft of the State Core Model was presented to state education data managers at the CCSSO EIMAC meeting October 5. A near final draft of the Model will be presented to the Nation’s chief education officers at CCSSO’s Annual Policy Forum November 19. Many more states are expected to become involved after that meeting. Level 1 – Agree to use CEDS and the State Core Model: The organization has made a formal decision to consider the data definitions, terminology and code sets for a core subset of data elements commonly used by and among state/district/postsecondary institution student information systems. Level 2 – Technically Documented: The organization has mapped to and can publish technical documents with metadata* that includes, the data definitions, terminology and code sets for a core subset of data elements commonly used by states in their P-20 SLDSs. 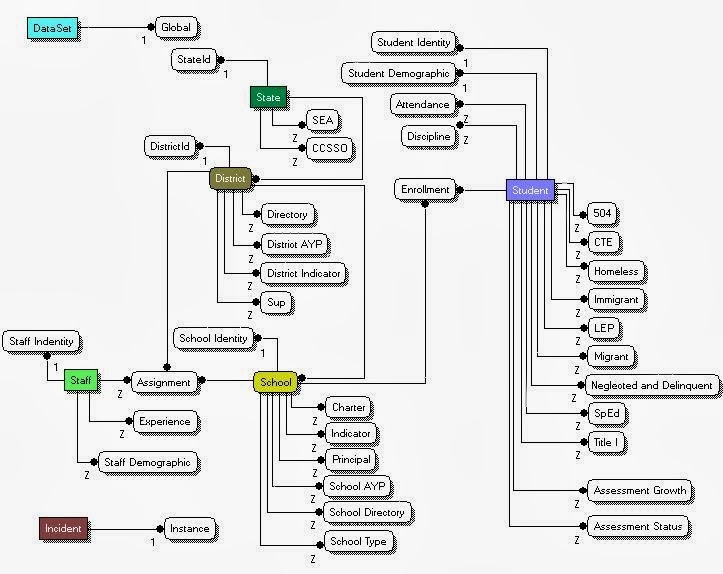 It seems to me there is a clear connection between Common Core, CEDS, data collection and national linkage. What do the Common Core proponents who insist there is no connection between CCSS and data collection say about this information?